It’s that time of year again – many businesses across Canada have begun the year-end budget audit, reflecting on the past 12 months and looking ahead to the New Year. In thinking about the budget for a new fiscal year there are many aspects to consider, including training, salaries, benefits, travel and more. It can be difficult to keep up in a rapidly-changing industry like the environment. Compensation planning, in particular, is often a confusing endeavor as companies compete for talent while still maintaining a balanced budget. Today there are many other incentives that encourage employee engagement, but compensation remains an essential factor in attracting and retaining the best employees. With such a wide range of environmental careers, how do you know if your offer compares to those of your competitors? ECO Canada’s 2012 and 2013 environmental sub-sector studies investigated half a dozen environmental sub-sectors and the occupations that fall within them, to determine the average compensation for each one. The studies looked at both average starting salaries and average salaries for workers with at least five years of experience. View detailed salary data for more than 60 different occupations across all six sub-sectors here. One of the most effective ways to save your company money is to find creative ways of retaining your best employees. Employee turnover costs companies both time and money, in recruitment, orientation, and productivity. It’s important to keep your best employees engaged by understanding their career goals and what they need from you. Don’t focus only on the next year; plan for your employee’s first five years – the most vulnerable years for turnover. Each of the six sub-sectors studied in these reports have different patterns for compensation growth. 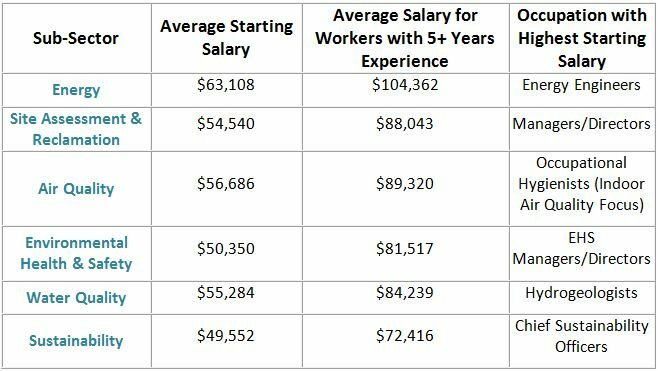 Energy, for example, offers the most room for salary increases, with Energy Engineers upping their salaries by more than $74,000 on average after five years of experience. EHS Engineers experience the most room for compensation growth in the Environmental Health & Safety sector, but by smaller amounts than energy (about $40,000). Even within a sector, trends vary widely – Sustainability Trainers can see up to $59,000 in salary growth after five years, while Sustainability Researchers average only $8,000 in growth. 2. Want legal peace of mind? You’ll have to pay for it. Many occupations across sectors in the environmental industry require a strong understanding of regulations and legislation implications. It’s important to identify what knowledge and skills you need your employees to have in order to keep up with the changing industry. You may have to pay more in salary and training to get those skills, but considering the shifting landscape of the environmental sector, having experts on your team to stay in front of regulation and legislation changes gets you ahead of your competitors. Hydrogeologists, for example, must be keenly aware of new legislation and regulation developments, such as the new Water Sustainability Act introduced in British Columbia earlier this year. With high education requirements and a strong demand for their talents, hydrogeologists can build a solid case for significant salary increases. Their average starting salary in Canada is about $74,000 and can go up to $114,000 with more experience. Knowing the average salary for an occupation is important, but keep in mind that it can vary widely across provinces. For example, according to Statistics Canada, New Brunswick’s average salary across all occupations is nearly 11% lower than the Canadian average, while Alberta’s is more than 20% higher. And while the rural-urban income gap has narrowed over time, those working in urban regions still tend to receive higher salaries. Depending on where you are located, you may be justified in paying below the national average, or you may be forced to go above average. If you’re paying less, it becomes even more important to build a strong employer brand and ensure you’re hiring the right people for your company. Use compensation within the context of other benefits, like workplace flexibility, professional development opportunities, and company culture. Contact us if you would like to receive any of the six full sub-sector reports.